I promise the mouse hasn't morphed into some kind of parallel universe for sesame street. but bear with me, just a little bit more sesame-esque chatter. 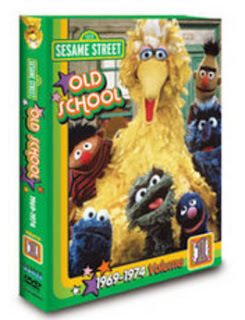 yesterday I ran across an article by media savant virginia heffernan on the recent release of two dvd sets of sesame street's early years. even if you aren't a sesame street aficionado you may find hefferman's review and sociocultural analysis of the show fascinating. "The old “Sesame Street” is not for the faint of heart, and certainly not for softies born since 1998, when the chipper “Elmo’s World” started. Anyone who considers bull markets normal, extracurricular activities sacrosanct and New York a tidy, governable place — well, the original “Sesame Street” might hurt your feelings." I am too old to have watched sesame street as a kid - the show of my youth was captain kangaroo. however, I was a new mom in the early 80s and I was vaguely aware of the show, I checked it out and immediately put sesame street into my childrearing bag of tricks. the show began in 1969 and by 1981 it was in full swing and firmly established as part of the early childhood landscape. 1981 was the year I started tuning in regularly - e was at an age when I thought adding a little educational t.v. wouldn't do any harm. we watched the show together and joined the sesame street family. there was a long stretch of time when I was away from the neighborhood, probably from about 1986 until two or three years ago. my work and daily activities changed and I suddenly found my 'village' bursting with toddlers. and in the course of hanging out with the under four set, there were days we would turn on pbs and see what's happening on 'the street.' I would have to agree with virginia, sesame street has changed! even though it's more colorful and not as edgy as it once was, the mission of sesame street remains the same - to help make the world a better place, to help kids learn the basics and to instill a love of learning. in the u.s., sesame street's main purpose is educational. and it sets out to help teach kids learn their abc's, count (to 20), embrace diversity, be a part of the community and even pick up some words in other languages - specifically, sign language and spanish. yes, in some respects sesame street is a different place now than it was in the early 1970s and 1980s - but nothing stays the same except perhaps the fact that things change. sesame street is also a very different street as we (and it) travel the world. did you know that sesame street is aired in more than 120 different countries? 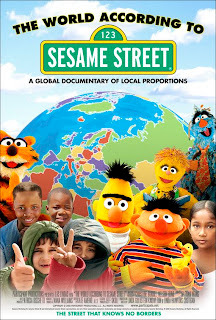 during the 2006 cleveland international film festival, I was fortunate to have attended a screening of the documentary the world according to sesame street. the film is both powerful and moving as it explores the challenges the folks from the sesame workshop encountered as they embarked on creating shows for kids in kosovo, bangladesh, and south africa. the film gave me a whole new appreciation and respect for sesame street's mission and the mother organization. unlike other global phenomena (you know who I mean!) which set out to homogenize the world, the folks from sesame street seek to create shows which are culturally sensitive - no importation of the monsters and characters from our north american show. sesame streets elsewhere have their own unique cast of monsters and a rap that is appropriate for where the location of that street. margaret mead would be proud. our library system owns a couple copies of the world according to sesame street, maybe yours does also. but, if it doesn't, no need to despair, dvds of the documentary are available for purchase and undoubtedly it's available to rent.